For some weeks, Sandra insisted that I visit the main shopping area of Canterbury and make my way to Tiny Tim's and take lunch. Sandra felt that the atmosphere and the set up would appeal to me as she had visited Tiny Tim's Tearoom on her own and enjoyed it immensely. She said that I would love the live pianist. 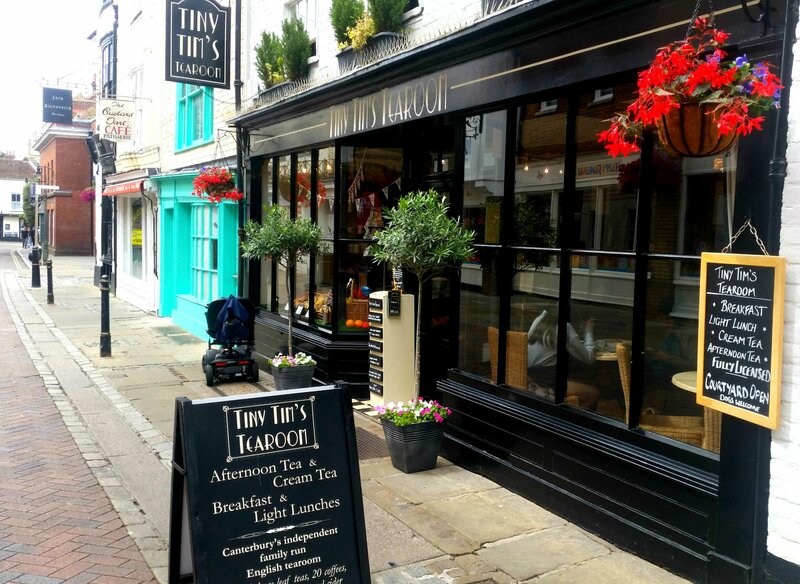 I had broken my golden rule….never to visit an English tea room on a busy weekend, so one Saturday I had parked a mile outside the City of Canterbury and made my way to Tiny Tim's Tea Room. There's no doubt that from the outside, the traditional frontage and the traditional signage showed off an nice tea room. I visited after 2pm and the place was packed with people. There were seats outside, but they were all taken up, so I had a choice. Try and be comfortable or come back another day. So I stayed in the 1930's atmospheric tea room. On offer was breakfast, light lunches, Huffkins and Puffkins, sandwiches, cakes, pastries and scones. I ordered a pot of tea, scrambled eggs smoked salmon with a wedge of bread. The food and tea was really lovely and I felt full. I had wanted to order a tea cake but could not get the attention of the waitresses, so I left after eating. I could barely hear the piano playing in the background nor could I see the pianist due to the place being packed with loud people enjoying cakes and teas. I would probably suggest to the manager or owner to lay off the pianist on Saturdays and introduce some background music instead as the full enjoyment of a pianist could not be truly appreciated, due to the small, packed tea room. I think you would have to go a long way to fault the Tiny Tim's Tea Room. The atmosphere was nice and warm, the food great, the staff nice. I think that the small tea room would be packed in the summer months so I guess that you take hit and miss as whether you get a seat or not. Parking is quite expensive in Canterbury but park and ride is available from two directions. If you enjoy walking like me, then park your car just outside Canterbury and walk about half to one mile, you will certainly enjoy the ancient City and the pot of tea awaiting you at Tiny Tim's Tea Room. I did not meet the owner although an e-mail was sitting in my in box when I got back into the office and Phil seems a nice person. I can recommend this Tiny Tim's Tea Room and visitors and locals will certainly enjoy themselves, not only the atmosphere and the music of the 1930's, but the food is great too. Canterbury is a historic English cathedral city, which lies at the heart of the City of Canterbury, a district of Kent in South East England. It lies on the River Stour. Originally a Brythonic settlement, it was renamed Durovernum Cantiacorum by the Roman conquerors in the 1st century AD. After it became the chief Jutish settlement, it gained its English name Canterbury, itself derived from the Old English Cantwareburh ("Kent people's stronghold"). 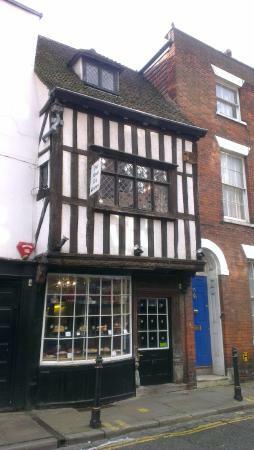 Right in the heart of Canterbury City Centre shopping community and a stone's throw from Canterbury cathedral, sits this two story quaint English tea room. It is a small and very busy tea room but homely and cosy. The staff members are very nice and welcoming and it was a pleasant visit on this very warm summer's day. I had an afternoon cream tea (minus the cream, replaced with my preference, butter) and the tea was Assam. The presentation was lovely (see above picture) on an old style cake stand with matching china cup. I stayed well away from their champagne cream tea! Good range of food on offer; freshly made sandwiches, daily lunch specials, breakfast freshly cooked, soup of the day, jacket potatoes and an assortment of cakes and pastries. There was also a wide selection of loose leaf teas and fresh coffee. It was a busy day and initially there was only one female staff member on duty and she was a little overwhelmed with the number of customers coming through the doors. However, after about 20 minutes, the owners brother, Mr Sandhu arrived and helped out. The only criticism I would have is that 5 out of the 7 cake displays in the window was not protected by the flies or bugs and could well do with being covered. I can recommend this quanit English Tea Room. Plenty of paid parking available, but free if you park slightly out of town and walk in.